Settle Your Injury Case or File a Lawsuit: What’s Best for You? Accident victims in Florida are protected by our state personal injury laws, which are designed to hold those responsible for harmful their actions. 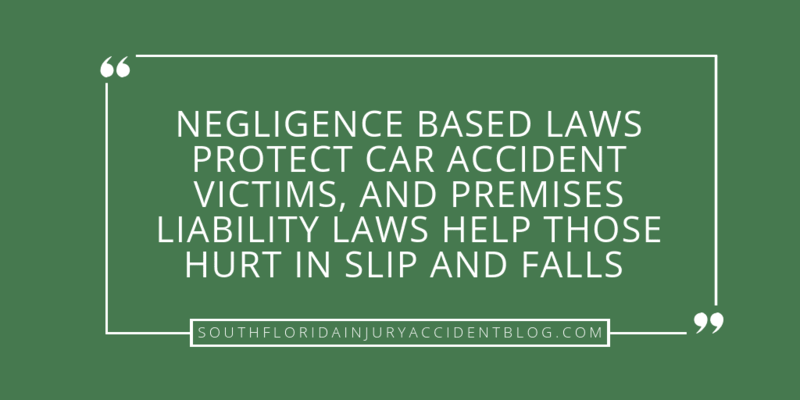 Negligence based laws protect car accident victims, and premises liability laws help those hurt in slip and falls at places like a grocery store or hotel bathroom. The Accident Claim Process: How Does It Begin? Seeking justice for a victim begins by making a written demand to the responsible party (or their insurance company). That demand letter can include requests for compensation to cover medical costs, lost wages, therapy expenses, pain and suffering, property losses, and other economic and non-economic losses. Once the demand has been made, then the process moves forward with the negligent party’s insurance adjuster or defense lawyer. Often times, the claim is resolved during this demand period. For instance, if liability is clear and the damages are not disputed, there may be a quick settlement of the claim. However, many claims are contentious. In these situations, the insurance adjuster will drag his or her feet because liability or damages is in dispute. Insurance is big business and they are not in business to lose money, even though a victim is just trying to be made whole again. Unfortunately, when a victim is unable to settle their claim on their own, there only real option is to hire a personal injury lawyer to help with negotiating their personal injury claim or to file a lawsuit on the victim’s behalf. Of course, the ultimate decision of whether to settle or file a lawsuit, is not for the lawyer to make. The claim belongs to the victim, and it is his or her decision to make. Because of this, many questions come to the victims mind, like “how do I know if I should accept this offer?” and “What information do I need to make this decision? the lengthy process that litigation typically brings, including cancelled hearings, rescheduled trial dates and jury selection. Also, when a lawsuit is filed, the victim and the victim’s lawyer will need to spend much more time on the case because the formal procedural rules of civil litigation will come into play. There are discovery deadlines and formalities to follow. The lawyer must pursue proving the case with admissible, authenticated evidence. Settlement negotiations pre-suit, on the other hand, are more informal. For instance, a witness statement may be sufficient in settlement negotiations. Once the lawsuit is filed, the statement may no longer be sufficient, and a formal deposition may be needed. Furthermore, most accident victims find that the accident aftermath is overwhelming enough without having to deal with defense lawyers and judges. The claim and litigation process can be difficult. No victim wants to be re-victimized by an insurance company or a defense lawyer. If you settle your claim for damages before filing a lawsuit, then you will receive your money right away. Many accident victims find this to be the better option, even if the settlement offer is lower than they anticipated, because the victim will be able to pay off pending medical bills and vehicle repairs sooner than if they were to file a lawsuit. The litigation process can take months or even years to conclude, and if there is an appeal of the jury’s verdict or the trial judge’s rulings, then the process will take even longer. Closure through a settlement may be the better course to take for the victim and his or her family, given this reality. Personal injury lawsuits can be expensive. If the victim proceeds to litigation, he or she will need a higher settlement offer just to net the same as the pre-lawsuit offer in order to cover those additional litigation costs and attorney’s fees. For example, there are court filing fees to file the complaint (in Broward County, the 2018 fee for filing a new lawsuit in civil court is $401.00 – see the Broward Clerk of Court’s Fee Schedule), process servers, expert witnesses, court reporters, and the testimony from doctors who will charge hundreds of dollars for each hour of their time. Additionally, once the lawsuit is filed, the legal fees will increase (in most cases). The accident victim will need to check his legal representation agreement, which is the formal contract signed by the victim and his accident lawyer. The agreement will explain how the contingent fee percentage will increase at each stage of the representation. When the case is filed as a formal lawsuit, the percentage may increase. If the case goes to trial, the percentage may increase. Contingent fee percentages will also rise if the case goes forward on appellate review. The accident victim will not be paying any of these fees and expenses during the pendency of the case, because it is a contingency matter. Even if the case goes on appeal and takes years to resolve, the contingency agreement will be effective and the victim will not have to reach into his pocket to pay for these costs. However, when the matter is resolved, these costs will be deducted from his gross recovery before he receives his net final compensation. A Florida accident victim may find that he will get a larger payment from the defendant in pre-suit settlement than if the case proceeds to trial, considering the additional expenses required by the litigation process. Additionally, for some legal claims, Florida law provides that the losing party in a lawsuit must pay the winner’s legal fees and court costs. If you settle before filing a lawsuit, then you will not owe the other side any costs or legal fees. For more, see: Florida Personal Injury Lawsuit Risks. When the accident victim negotiates a settlement with the opposing counsel during the litigation process, the parties and their lawyers negotiate a deal. Sometimes, there is a formal mediation where the mediator is involved to help facilitate a resolution. If the injured party settles before filing a lawsuit, then the victim gets to make the decision on the settlement amount. If the case goes to trial, that decision is taken out of the victim’s hands and the jury will decide who is liable for the damages. Once the jury decides how much each party was liable, in percentage terms, then they decide the amount of compensation the victim receives for his or her injuries. Having a jury decide your case is risky, because the decision may or may not be in your favor. After any injury trial, there will be a review of the entire trial proceedings by the losing party. If there is an argument for “reversible error,” then an appeal can be filed. This will put the case on hold while the arguments are heard at the appellate court. If a new trial is ordered on the issue(s), then there will be another court proceeding at the trial level. All this must happen before you are paid your damage claim, no matter how certain you are of your legal position and regardless of how you are victorious at every stage of the appellate process. In Florida, contributory negligence is a recognized defense. This means that if the defendant can substantiate that the victim contributed to the accident, then this will reduce your award of damages. For example, if you are found to be 10% contributorily negligent in a car crash, then the jury award will be reduced 10%. In a lawsuit, any pre-existing injuries or prior injury claims from the victim’s past may be used against them by the defendant. For instance, pre-existing back injuries may be used to argue against your spinal cord injury claims in the slip and fall litigation. If the accident victim settles before filing a lawsuit, then he or she does not have to give the insurance adjuster this information. Of course, the defense may be aware of the prior accident or pre-existing injuries during settlement negotiations. There is no guarantee that the insurance adjuster, for example, may not discover a pre-existing injury upon reviewing medical records provided to support your medical expenses claim. See: Can a Pre-existing Condition Hurt Your Accident Claim? When the accident victim goes to trial, the jury decides whether or not the defendant is liable for the accident, whether or not each element of damage claimed by the plaintiff is compensable, and how much should be awarded to the plaintiff. Every plaintiff in a civil lawsuit runs the risk of receiving nothing. Pain and suffering is very real for victims, but for many juries they are discounted. Florida appellate courts may reverse a jury verdict of zero damages for pain and suffering as being “inadequate as a matter of law,” and send the issue back for another jury to consider. However, this may take years to resolve. Accident victims need to understand that accepting a decent settlement offer in hand may be a better decision than risking taking their claims to a jury. There’s always a risk when a jury is involved. Should you settle or sue? An experienced Florida personal injury attorney can help you in making your demand for damages after a serious accident. He or she can also help you evaluate your situation so you can decide what is best for you and your family: to negotiate a formal settlement agreement or to file a formal civil lawsuit. If you or a loved one has suffered injuries from an accident here in Florida, and you are not sure if you should you settle or sue, then a good piece of advice is to speak with an experienced personal injury lawyer to learn about your options. Most personal injury lawyers, like Alan Sackrin, will offer a free initial consultation (over the phone or in person, whichever you prefer) to answer your questions.